Australia was colonised by Britain from 1788 and, since then, people from Britain and Europe have been encouraged to make Australia their home. Sometimes they came as hopeful new settlers, and sometimes as desperate people seeking any refuge from war and destruction in their homeland. 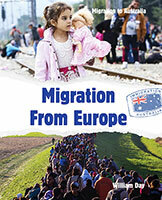 Find out about the different push and pull factors that encouraged migration to Australia from the countries of Europe. Discover the enormous contribution the new settlers made to the development of the nation, and the ways in which their varied cultures have helped create a unique Australian way of life.